Who has ever heard of that! The kindergarteners started to grow pumpkins 104 days ago on September 25th. Right now the pumpkins have male flowers and have large green leaves! The vines are fuzzy and 48in long, and they are growing into each other. The flowers are a pale yellow and and you can see the veins and moistness in the petals. “The second question was “Do you like being a scientist?” The almost all of the answers were “yes” but their reasons were because “it is fun”, “learn new things,” and “you get to figure things out.” One kid seemed like he got up on the wrong side of the bed, because he did not want to answer any questions. As of right now there are no female buds. 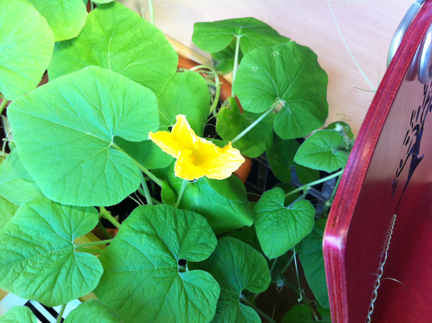 We think it is because the library is too cold, so it is hard for the pumpkins to grow. The Kindergarteners seem to have faith in their pumpkins. We don’t know if the pumpkins will grow, but we do know it took a lot of hard work to get this far.